The Tornado Tube® has “wowed” science enthusiasts young and old for over 25 years. At the Tornado Tube®’s conception the nationally syndicated “Today Show” featured the tube. Throughout its’ years, national and local television meteorologists have swirled the Tornado Tube® during their weather reports to help viewers understand vortex action. Many of these meteorologists use the Tornado Tube® as visual aids when visiting classrooms. Newspaper photos pop up in all corners of the US as school age children work on science experiments using the Tornado Tube®. Colleges order the Tornado Tube for more sophisticated experiments and discussions. 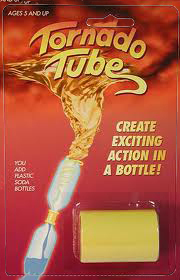 As an inquisitive young boy, Craig Burnham invented the TORNADO TUBE® as he experimented in his parents’ basement. Fifteen years would pass before Craig sought for and received a patent for his science toy. Since its debut at the New York Toy Fair in 1988, the TORNADO TUBE® has become increasingly popular and sells worldwide! Partially fill with water one of the 2 two-liter size plastic soda bottles. Tip, so that the full bottle is on top and give it a circular starting whirl. Presto! You have a vortex. Call it a tornado if you’re a meteorologist, or a whirlpool if you’re into oceanography.